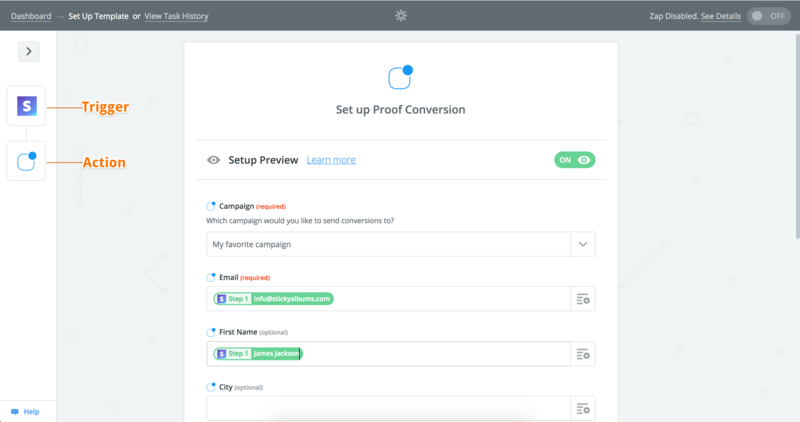 Zapier lets you connect Proof to 1,000+ other web services and capture data (sign ups, purchases, etc). These user actions can then be displayed as Recent Activity notifications on your website. Once you've found the 3rd party app that you'd like to connect with, please follow the setup instructions below. A popup window will display next. Copy your Proof API Key to your clipboard (when you're setting up your zap, you'll be asked to enter the API Key). You can always find your API Key under the Account settings page as well. How do I connect Proof to Zapier? Now click on "Connect new account" and search for "Proof"
Use your credentials to connect your Proof account to Zapier (this is where you'll paste your API Key). Once that's done you can start creating an automation! 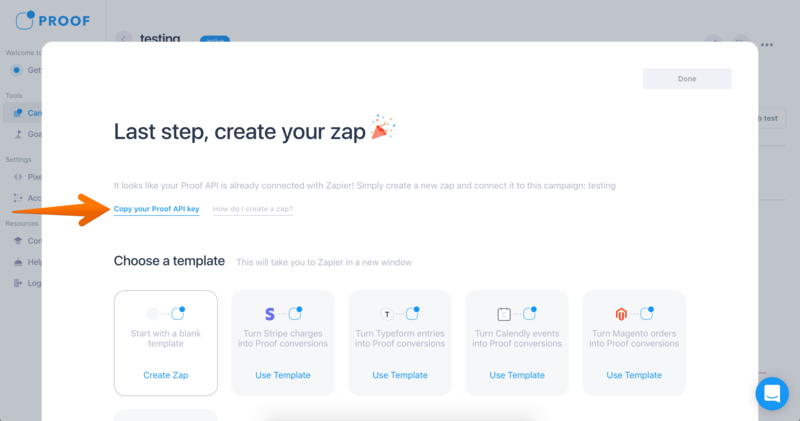 Use a pre-made Zap or create your own with the Zap Editor. Creating a Zap requires no coding knowledge and you'll be walked step-by-step through the setup. Make sure to select your 3rd party app as the Trigger step (e.g Stripe) and select Proof as the Action step. If everything is setup correctly you should see a test conversion come through from Zapier. Let's check your campaign for a new contact. How to display a specific location on your notifications?